Matt Cosper is about to get medieval on all our asses. "I'm fascinated with the Middle Ages," the 37-year-old director of local experimental theater troupe XOXO says. "I harbor this romantic notion of traveling players and pageant wagons, Robin Hood and the plague." That last item is a tip-off to our contemporary fascination with the Middle Ages, an appeal that fuels the popularity of TV shows like Game of Thrones and Vikings, Cosper believes. The dark ages were a dark time, the era of the Black Death, which wiped out close to 60 percent of Europe's population — and that was just the most obvious disaster in an age of calamity that's much like our own. In the same way that contemporary artists and audiences are enthralled by the apocalypse or the end times, Cosper continues, the medieval period is interesting because it was a post-apocalyptic time. In the wake of the collapse of the Roman Empire — and the collapse of the culture and progress it had brought to Europe — the people of the Dark Ages believed they had seen the end of the world. They were picking up the pieces in an era stripped bare of civilization. "In the way that history is fractal, we're living through a medieval moment now," Cosper says. "We're in a dark age, and our president is a feudal baron." While the Middle Ages gave us noble knights, chivalry and poetry about courtly love, it also brought famine, class oppression and a protracted series of holy wars called the Crusades. 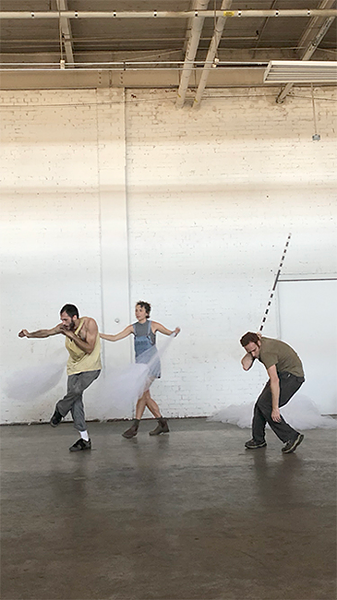 One of those clashes has inspired XOXO's latest project, All Our Little Innocence (The Children's Crusade), which the troupe will preview as part of Feedback, an evening of poetry, theater, music and dance works in progress at Goodyear Arts in Camp North End on August 25. Cosper's focus on the crusade is a confluence of influences, he explains. He's interested in how childhood experiences shape the adults we become. He also cites his love of lost causes as part of the allure of The Children's Crusade. As misbegotten pilgrimages go, The Children's Crusade is particularly poignant or pointless, depending on your point of view. In 1212, in Germany and in France, two shepherd boys had concurrent visions of Christ, Cosper explains. Jesus told the boys to gather followers and to march to Marseille. Once they arrived at the seaside port, God would part the waters, the shepherds believed, whereupon the children gathered from across Europe would walk across the dry seabed to Palestine and deliver the holy city of Jerusalem from its Muslim masters. The children would convert the infidels not with the sword but with their love of Christ. At least, that was the plan. Some sources say that 30,000 people converged on Marseille, Cosper says. Needless to say, the Mediterranean Sea did not part, and Marseilles' officials were in a quandary about how to feed, clothe and shelter all these people. "The city leaders rounded up some ships, put the children on them, and sent them off," he says. From there, the crusade went from bad to worse. At least half the ships foundered in storms, and all on board were lost at sea. Unscrupulous men captained the remaining ships. They delivered their cargo of devout children not to the holy land, but to the slave markets of Egypt. Clearly, this crusade would be a damning indictment of all crusades, a tragic episode of innocence betrayed — if it ever happened at all. "It's all legend," Cosper says. "No one knows how much of this actually happened. I just love the fairy tale aspect of the story, with its echoes of the Pied Piper." Cosper stresses that the legend of the Children's Crusade is merely a jumping off point for XOXO's work-in-progress. It's a shared imaginative world that will guide its creators toward an unknown destination. Like past XOXO productions, including the psychedelic acid western All the Dogs and Horses, the corporate dystopia of #CAKE (Year Zero) and Bohemian Grove's immersive journey to the afterlife, Cosper believes that All Our Little Innocence (The Children's Crusade) will go through considerable changes over the course of a year or more of development. The end result may have little to do with the events and legends of the 13th century. XOXO is also using the Children's Crusade as a jumping off point to describe a new way of working, Cosper reveals. The crusade is not just the topic of the troupe's work, he says, it's a metaphor for the strategy the company is using to move into the future. "It's sort of a naïve and faithful exploration," he explains, "a willingness to get lost in our show." Cosper sees ensemble theater as the same kind of utopian project as a faith-based crusade. The Children's Crusade is not just a new show for Cosper and his company, it's XOXO's exploration of a whole new way of working. Certainly the company has gone through changes since it's production last summer of #CAKE (Year Zero). Former managing director Karina Caporino has moved on the new projects, and the troupe has stripped down to four members including Cosper, past cast members Jon Prichard and Kadey Ballard, plus newest member Will Rudolph, who Cosper started working with at his day job as theater teacher at Charlotte Latin School. "There has been a shift as to who is in the room," Cosper says about the troupe's personnel changes, "but there has also been a shift in how we create the work." 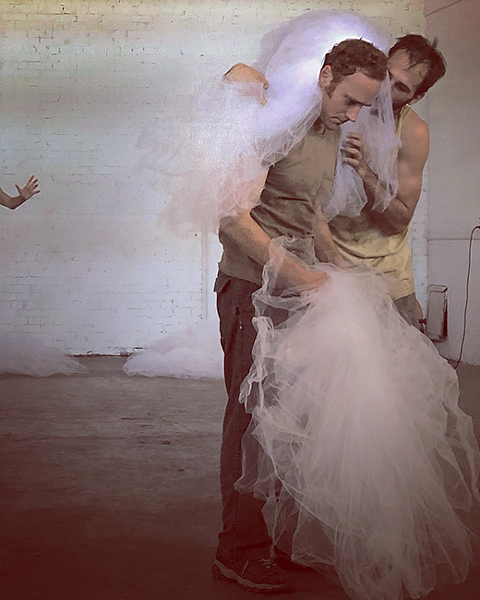 Ever since XOXO emerged from Cosper's previous company Machine Theater in 2012, shows have been created through collaboration. That is still true of the new streamlined XOXO, Cosper says, but nowadays there is less talk and more action. "It's a game of follow the leader on steroids," he says laughing. As the actors run in a circle, group leadership is passed around like a baton. Each successive leader calls out a series of moves — exercises that combine endurance training with the principals of balance, imbalance, target and intention. The training also involves sticks — lots of sticks. "We toss these sticks to each other as we run through the room," Cosper says. "And then we add more sticks." The goal is coordination, communication and endurance. The second half of each rehearsal is devoted to long-form improvisations. This is where the raw material for All Our Little Innocence (The Children's Crusade) has been created. No one is sitting down and writing a plot beforehand, Cosper says. Instead prompts are thrown to the performers to generate improv sessions. Some of the prompts are literal, Cosper explains, like "the plague." Others are more general, like the word "thicket." The object is to reinforce a shared creative world for the performers to inhabit, a Middle Ages of the imagination. 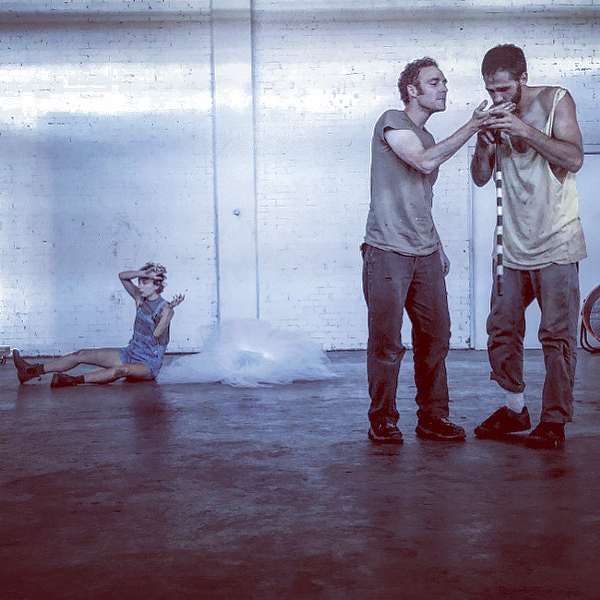 Cosper credits the proximity of dancers and choreographers at Goodyear Arts with aiding the development of the show. Ballard, who leads the training/workshops, has adapted improvisation exercises used by XOXO's dancer neighbors for use by the troupe. First XOXO records their improvisations. Later, they sift through the recordings and pick out the good parts. "We're building the material out of these improvisations," Cosper says. "It's a fairly regular practice in the dance world, but it's new to us." A song that Ballard discovered, called "Mirie it is while Sumer Ilast," aids this process of creation through improvisation. Dating from the early 13th century, it is the oldest song in the English language, specifically the Middle English later used by 14th century poet Geoffrey Chaucer. The lyrics celebrate summer, but not in the way modern songs go on about fun in the sun. Instead, the tune praises the mild weather because people are less likely to starve than in winter. "We're doing these improvs, and then we're overlaying medieval songs and some text I've been writing based on the Children's Crusade," Cosper says. "Collage is the best way to describe how we're constructing the piece." XOXO is piecing together moments that have come out of the performers' subconscious through improvisations, and then finding meaning in the pieces. "Because humans are meaning-making machines, right?" Cosper says. Despite the unusual methods and circumstances surrounding the show's creation, Cosper stresses that All Our Little Innocence (The Children's Crusade) will resemble a more-or-less conventional stage presentation. Down the road, XOXO's version of the Children's Crusade may become an immersive journey, a literal pilgrimage on foot for the audience, but for now the show is an abstract play sans embellishments. "This is our chance to try out the material in a room with an audience,"
Cosper says. XOXO's recent work and new direction is all about honing and simplifying presentation, he continues. "We're stripping down the artifice and getting back to the essentials of performance," he says, "which is the human body onstage observed by other humans."